The great thing about the Cruzbike conversion kit is it let's you try lots of different frames. Defjack has had his on at least four frames I know of. This is my second frame I've had the kit on. The great thing is, you do no damage to the bike that can't be reversed. This is a Trek Moutaintrack 220, a kids 24" mountain bike. I put 650c wheels on it and they work great. I still have to resolve a back brake, but the front was easy. This thing screams! 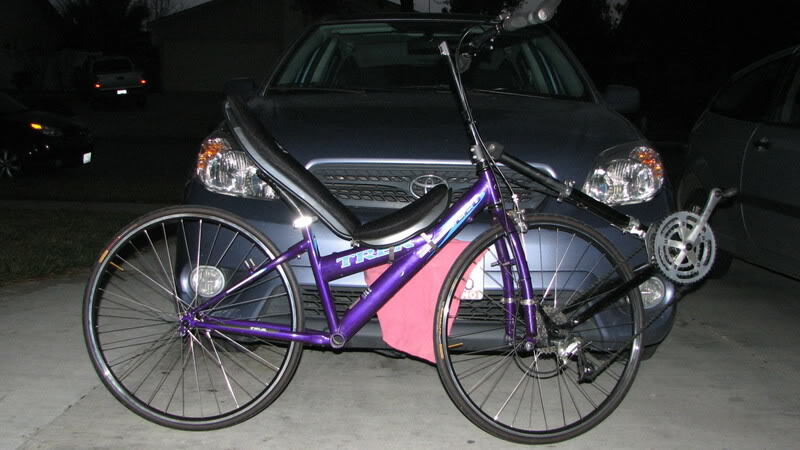 We're talking about a really cheap recumbent that gets up and goes! I have a Question, I've seen two or three of these conversions here and on there forum and something that bugs me is the front fork. Is there a reason it has to be backwards cause it really makes the whole bike look weird. Front fork spacing is usually 110 mm as opposed to rear fork spacing of 135 mm. In order to get the rear wheel to fit on the front a spacer has to be used and this moves the axle forward. Turning the fork around removes some of the trail that is induced by having the spacer in front of the original fork. Too much trail and you wind up with "wheel flop". Racer46 wrote: Front fork spacing is usually 110 mm as opposed to rear fork spacing of 135 mm. In order to get the rear wheel to fit on the front a spacer has to be used and this moves the axle forward. Turning the fork around removes some of the trail that is induced by having the spacer in front of the original fork. Too much trail and you wind up with "wheel flop". Ding, ding, ding! We have a winner! Been doing your homework, I see. Admin.- Yes, I agree it looks weird, but the handling is great! Despite the backwards fork, you gotta admit...... That's one rockin' bike! Cheap, too and your imagination is your limit. The kit is only something like $400 and comes in a pretty small box. You can stash it and break it out a little at a time. Man, you can't get away with anything, then, huh? If possible have it shipped to where you work. Another good idea, but I'm Retired. Hey if I want something I'll just buy it and suffer the consequences. It wouldn't be the first time. Do you mean a complete kit or a bike with a kit installed? I'd assume bike with kit at that price. That's what I thought too but the retail price of a new kit is about $400. Racer46 wrote: That's what I thought too but the retail price of a new kit is about $400. Yup and used will discount it greatly... Throw in a wally mart bike and..... about four bills. R42Pilot wrote: Man, you can't get away with anything, then, huh? BWAHAHAHA! You guys all crack me up! Trying to figure out a way to get around the little woman so you can get that budget SWB! Okay, okay, so I have the parts shipped to the office, build it there, bring it home hidden in the back of the SUV, sneak it around the back and put it in the shed ... so, what's the plan on when I get to RIDE it? Man, do I have to do all the thinking around here? You don't sneak it home at all. You jump for joy and exclaim that you just bought a can't pass it up deal on e-bay for 36 bucks, then you drive over to your office, pick it up and bring it home! Wait, did I really just type that out loud? R42Pilot wrote: Man, do I have to do all the thinking around here? You don't sneak it home at all. You jump for joy and exclaim that you just bought a can't pass it up deal on e-bay for 36 bucks, then you drive over to your office, pick it up and bring it home! Holy Moly! Where WOULD we be without you, R42Pilot? BUT! In order for this to work, we're going to have to enlist the aid of Admin to sanitize this thread; remove all traces of The Plan! Otherwise, when I try to get my sweetheart to take a look at this board to see how much fun we have ... the jig will definitely be up! I'll let ya know, Admin, when I'm ready to implement Phase 2 of The Plan (the "jumping for joy" part). First of all, I really did score the Infinity for $36... That was no ploy. But, I have used this ploy succesfully before with brewing equipment, so I know it can work. And if you're thinking about feeling guilty if you do use this tactic, just know that women use it on us all the time. Do the words, "But.... It was ON SALE!!" sound familiar? Uh-huh.... So you stretch the "on sale" a little bit, you're probably due after all these years.